Internal fixation of fractured arm bones. 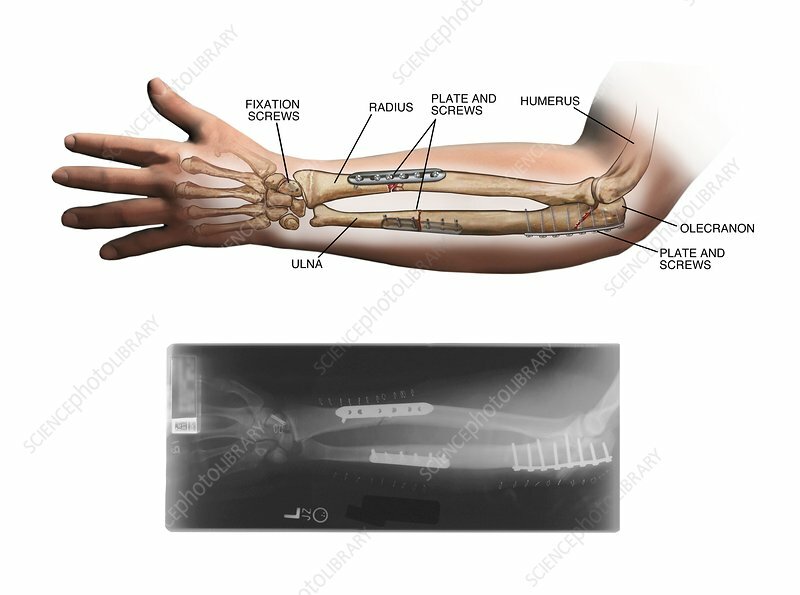 Labelled artwork and corresponding X-ray of internal fixation of fractures of the radius, ulna and wrist bones in a patient's left arm. The operation carried out was an open reduction and internal fixation. Screws and metal plates have been implanted across the fractures to hold the broken bones in place, allowing them to heal in the correct alignments. The fractures shown here are of the shafts of the radius and ulna, and of the olecranon (right) at the proximal (elbow) end of the ulna. A screw has also been inserted into the scaphoid bone, one of the bones of the wrist (left). For the X-rays taken before the operation, see C021/0782.